This is a review of Nuvo’s Genetic Hair Restoration Formula Review, a combination oral supplement and hair foam. 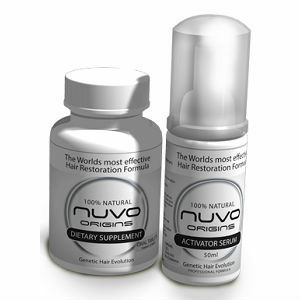 Nuvo claims that this product is able to slow or even stop hair loss. They further claim that their product can return elasticity to hair, by providing vital minerals and nutrients. Continue reading this article to find out if this is the right product for your needs. After reviewing the recommended dosage provided by Nuvo, it is suggested that individuals take one tablet daily, with food. This is followed by the application of their Activator Serum foam, directly to your hair and scalp. This foam is also to be applied once daily. This product is not recommended for individuals under the age of 18. After looking into the information provided by Nuvo about both their oral supplement and hair foam, it seems that their product does indeed contain high enough levels of the active ingredients and compounds to have a noticeable and positive impact on the human body. While specific levels could not be found on Nuvo’s web site, there are several peer-reviewed, scientific studies that back up the effectiveness of Nuvo’s proprietary blend. Nuvo recommends consistent use for at least 60 days before effects may be seen. Nuvo states that no side effects or drug interactions are known to exist. However, there always exists the possibility for specific nutrients to interact with medications, and because of this, individuals should always keep their health as their first priority when selecting a dietary supplement. Nuvo recommends that if individuals have any questions concerning specific drug interactions, that they should always consult their physician first. One package of Nuvo’s Genetic Hair Restoration Formula costs $77.98 and contains thirty pills & one bottle of foam, enough for a 1 month supply. No subscription program seems to be available at this time, but there does exist a rewards program where individuals can accumulate points and savings based on past purchases. No discounts are offered for bulk orders. Only one review could be found on the company’s web site, and while this review was positive, it’s certainly not enough to prove the product’s effectiveness. Nuvo offers a 30 day money back guarantee, no questions asked. Returns are also accepted for either damaged or mis-sent products. Only one review could be found on the company’s website, and was quite positive. Nuvo’s Genetic Hair Restoration formula seems to be a solid product. There exist several peer-reviewed, scientific studies showing the effectiveness of the ingredients included in both their oral supplement and hair foam, all of which are easily accessible online. Also, they offer a great 30 day guarantee, which gives individuals the chance to try this product free of risk. A couple of things to keep in mind, however, are the exceptionally high cost of the product, as well as the lack of reviews or customer testimonials. John Brownstone	reviewed Nuvo Genetic Hair Restoration Formula	on July 1st	 and gave it a rating of 3.5.